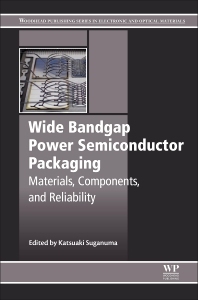 Wide Bandgap Power Semiconductor Packaging: Materials, Components, and Reliability addresses the key challenges that WBG power semiconductors face during integration, including heat resistance, heat dissipation and thermal stress, noise reduction at high frequency and discrete components, and challenges in interfacing, metallization, plating, bonding and wiring. Experts on the topic present the latest research on materials, components and methods of reliability and evaluation for WBG power semiconductors and suggest solutions to pave the way for integration. As wide bandgap (WBG) power semiconductors, SiC and GaN, are the latest promising electric conversion devices because of their excellent features, such as high breakdown voltage, high frequency capability, and high heat-resistance beyond 200 C, this book is a timely resource on the topic. Dr. Katsuaki Suganama graduated from Tohoku University Faculty of Engineering in 1977, and since then has had a highly influential role within the fields of Physical properties of metals/Metal-base materials, Inorganic industrial materials, Metal making/Resorce production engineering, Material processing/Microstructural control engineering, Structural/Functional materials, Composite materials/Surface and interface engineering, Inorganic materials/Physical properties, Electronic materials/Electric materials. He has published several academic papers and books during his career, and has won many prestigious awards such as Best Paper of Symposium/Best Paper of Session in the 33rd International Symposium on Microelectronics and the Richard M. Fularth Pacific Award. He has worked as Professor at Osaka University Institute of Scientific and Industrial Research since 1996.